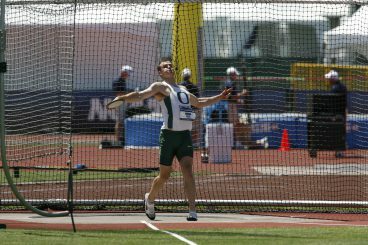 Dakotah Keys has been the face of the Oregon Track and Field decathlon since Ashton Eaton graduated in 2010, but as a recent graduate, Keys now has a multitude of decisions to make regarding future opportunities in track and field. For the uninitiated, Keys was a three-time Pac-10/12 decathlon champ, a number equal to that of current decathlon World Record holder Eaton. 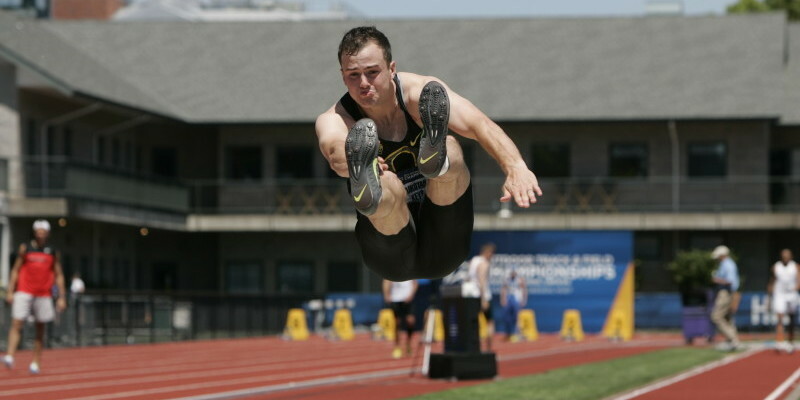 Keys also was a six-time all-American in track and field, twice finishing third at the NCAA Championships, while helping the Duck Men win back-to-back NCAA Outdoor Championships. I got together with Dakotah to discuss the process of transitioning from collegiate star to professional track. While all-American football, baseball or basketball players are often guaranteed a path to financial security for life, track and field ahtletes have no draft after graduation and athletes are pretty much on their own to make the best deals possible to enable themselves to continue to train at levels which will allow them to compete with professional tracksters. While a select few superstar collegians are actively pursued by agents, many high quality athletes such as Keys need to pursue their own deals, many of which involve little more than equipment, small stipends and performance bonuses with the promise of potential riches only after national or world professional triumphs. Compare this with the long lists of football and basketball washouts who still manage to leave their sports in excellent financial condition. Keys’ future is further complicated by the responsibilities of marriage and impending fatherhood (he has a daughter due in September), so sharing an apartment with half a dozen other guys and living on the dirt cheap isn’t really an option. Keys also needs to find a coaching/training situation which will further his improvement while also allowing him to work at least part time to support his growing family. At this time, Keys is working three days a week as a tree-trimmer while dedicating the rest of the week to track and field and family. While the US has a good program for athletes such as Keys at the Olympic Training Center in Chula Vista, Calif., moving a wife and small child away from family presents a great amount of hardship that Keys chooses not to put upon his family at this time. He indicated that should the opportunities at the OTC continue to exist, it might be a possibility once his child is older, presuming that his wife would be comfortable with such a move. Another issue is that shoe companies aren’t beating down the doors of athletes who can only compete at a high level several times a year, while sprinters, distance runners and most other field athletes make appearances in their sponsors’ clothing dozens of times each season and oftentimes in several different events, thus furthering the exposure of the sponsor’s product. The Catch 22 here is that in order for a sponsor to reap great benefits from a decathlete, the decathlete has to be at or near the top of the world rankings during relatively few chances of exposure time, but how do you get to that level without some sort of financial support to allow for shorter work weeks and more training time? Keys hopes to find a shoe company which will take a chance on him, with the hope that he’ll appear on the Olympic stage next season (he figures 8300-8400 points will make the team and that he can improve to that level given the right amount of work combined with harder focus on technical skills versus the volume stressed with younger athletes. This can be emphasized by Eaton’s improvement of nearly 600 points after college). Fortunately for Keys, he’s a well-rounded and patient person who draws his strength from his faith and close extended family (no other Duck athlete has Keys’ family support at meet after meet and his mother, Lela, actually attended seminars which allowed her to help coach Keys during the summer months in high school). His work ethic is off the charts, and he’s a quiet person who leads by example. For this reason, he was a team captain for three years and worked closely with other team multi-event performers to help improve their marks. In fact, once it was apparent that he couldn’t move up from third in this year’s NCAA competition, he took the time to demonstrate javelin techniques to runner-up Pau Tonneson of Arizona, who responded with a huge PR. While the primary emphasis is to continue to compete, coaching represents a back up plan (who wouldn’t want a calm, composed coach who knows intricately nearly every event?) and there’s also a desire to use his Sociology degree to help children in need, perhaps as a counselor for the Oregon Department of Human Services. Some other “Key” notes: Eaton was Keys’ sponsor during his recruiting visit and has helped Keys with both technique and verbal support over the years. Keys cites Steve Prefontaine as being an original hero, not so much for his success on the track as his success in community involvement. Keys chooses his athletic role models not merely on performance, but mostly on character. He credits his marriage right out of high school as a huge reason for his athletic success at Oregon. His back-up support at home kept him away from drinking and drugs that sometimes derail young athletes finding their way in college sports. In fact, Keys has never taken a drink nor used any illegal substance. Keys began his track career in the 7th grade, following his older brother who had taken up the sport. His mother insisted that if her boys joined a team, there was to be no thought of quitting if things didn’t work out. Keys has always wanted to express his thankfulness to his coaches by working as hard as possible. He was invited to join this year’s Thorpe Cup competition, a US vs Germany decathlon competition which has featured such superstars as Tom Pappas and current World Championship team member Zack Ziemek. 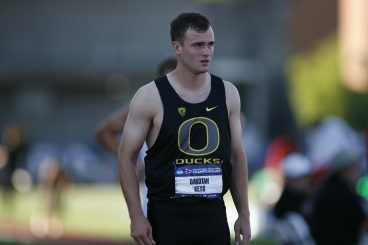 Keys also holds great expectations for teammate Mitch Modin, who was also invited to compete for the Thorpe Cup and now represents Oregon’s best future hope in the decathlon. For Keys, the actual decathlon competitions have represented a rest from the hard work put in during five-hour-a-day practices and the worst part of being a decathlete is getting to only compete for a few minutes, while spending hours sitting around between events or patiently waiting for one’s turn in an event. During such events, focus is paramount and the successful decathlete must stay in the moment and not dwell on what might have happened in a prior event or what might happen in the next event. He anticipates that the events he can most improve in are the hurdles, discus and pole vault and that improvements in these events will be key to attaining the points needed to make the Olympic team next year.